Most companies don’t have a team member that is solely dedicated and trained to manage their document destruction. And because of this, asking a valuable member of your staff to take time away from their assigned duties decreases productivity and efficiency. 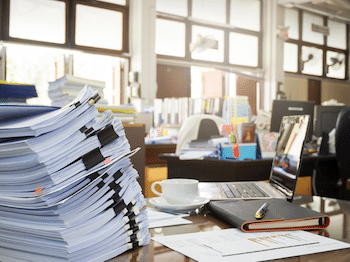 Employees who are tasked with shredding papers put aside essential duties and because they’re not experts in document destruction can make costly mistakes. These kinds of errors can also lead to the breach of confidential information and create compliance risks for your organization. The days of storing sensitive documents in file cabinets for years and years are over. Partnering with a shredding service provider allows you to safely dispose of documents you no longer need, without the fear that your company’s records, confidential information, and client data will be exposed or fall prey to thieves. And, when you eliminate unneeded paperwork, you’ll have the opportunity to decrease clutter and maximize your workspace. Once you’ve outsourced your document destruction, you and your team will have more time to focus on the tasks at hand—running your business. And, because your shredding service provides a certificate of destruction, you’ll have the peace of mind that your confidential information is safely and permanently destroyed, minimizing your risks for breach. When you’re ready to maximize productivity and efficiency, minimize risk and enhance security for your company, talk to us at All Points Mobile Shredding. Whether you choose onsite or off-site shredding, we can ensure that your documents are securely destroyed. Give us a call at 772.283.4152 for more information. ← Phishing scams: Knowledge is power!